In Rocky Mountain Fugitive, an estranged couple is reunited incidentally when they learn that their local sheriff is framing them for a crime they didn't commit. Eric Lander is out on a rock-climbing adventure with Randy Trask - the town's notorious troublemaker - when the sheriff and his men arrive and literally shoot Randy down. Eric then makes a getaway for the ranch owned and ran by Sarah Trask - Randy's sister - to break the news to her about her brother. However, when Eric arrives at the ranch, Sarah is already being held hostage by the evil and sinister sheriff. When Eric and Sarah finally manage to escape the sheriff, they are forced to run for their lives, and to get to the bottom of the reason for the sheriff's blackmail. Sarah is about three months pregnant with Eric's child, but the two must first work through their past issues if they want to be together - 'til death do them part. Rocky Mountain Fugitive is more action-suspense than romance, which makes for a refreshing interlude from the usual sappiness these types of novels encompass. Don't get me wrong, this one has its fair share of sappy romantic thoughts that fly through the heads of both Eric and Sarah, but it's perfectly endurable. There are no lulls in this very busy and action-packed novel. The mystery portion of Rocky Mountain Fugitive is well-thought out, and offers a bit of a surprising ending. My favorite part of the novel is when Eric and Sarah hitch a ride on a trailer to get to the Cody, Wyoming rodeo grounds in an effort to learn more about the owner of a rodeo championship belt buckle. I find it remarkable that Sarah can get around like a champ jumping over fences and running through the wild considering her pregnant condition. Awesome. 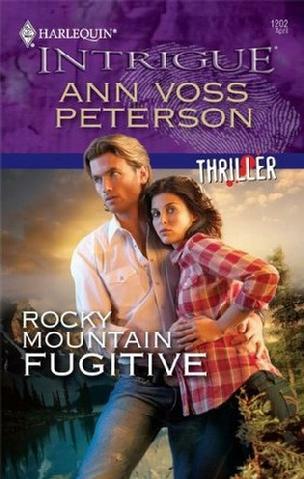 Other Harlequin Intrigue novels written by Ann Voss Peterson include Seized by the Sheik, Wyoming Manhunt, A Rancher's Brand of Justice, and A Cop in Her Stocking. What are your favorite romance novels? Do you enjoy Harlequin Intrigue novels, and if so, what are your favorites? Share your thoughts with us in the comments section below!